Torchlight Lighting a Path to Consoles? Runic's excellent Diablo clone Torchlight may be on its way to a console near you, if the developers have their way. 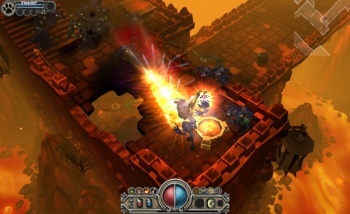 In case you were off the internet last fall, Runic Games' action-RPG-dungeon-crawler Torchlight was a really, really good game and one of the best ways to pass the long time until the release of Diablo III. Whereas Blizzard has admitted that it has vaguely considered porting D3 to consoles, though, the team at Runic is gung-ho about making it happen. "We're going to put some serious effort into it - pretty quick - getting Torchlight onto consoles," Runic Games CEO Max Schaefer told The Rumble Pack. "There's a lot of really cool things about the console world, too, that would work well with our game." The sentiment is certainly appreciated, as is the idea of a larger console audience getting to experience the loot-driven pure that is Torchlight. More people getting to experience an awesome game - what's bad about that? But it isn't like there aren't difficulties with the idea: Torchlight, like Diablo, is very heavily based around rapid-fire clicking with the mouse to attack, use abilities, and pick up all the loot the drops. It's not impossible to imagine that the system could be adapted to consoles, but controllers are just inherently less precise than computer mice for that sort of thing. Still, if Runic pulls it off, it might encourage Blizzard to do the same for Diablo III. And wouldn't that be awesome? Unlike RTS games, ARPGs are one of the primarily-PC genres that could potentially be viable on consoles.